(Berrett-Koehler, Oakland, California, 115 pages, $24.95). Millions of poor or middle-income Americans didn’t get the memo, a message of self-improvement and self-realization. The author warns that it is up to them to improve themselves. They must take the most basic steps to ensure they and their families have a decent life. They can’t wait for others to ride to their rescue, the author argues. The memo includes this: Americans must understand that they are the CEOs of their own lives and their personal wealth, they are the holders of their personal company stock. And their lives, to a large extent, will ride on what they do. Bryant’s message resounds with almost anyone who lives in a modern welfare state and thinks any government left or right will take care of him or her. Victorian Wisdom in the 21st Century? This is a book that echoes some of the self-improvement themes of the Victorian author Samuel Smiles, who the author may or may have read, but carries some of Smiles’ ideas. 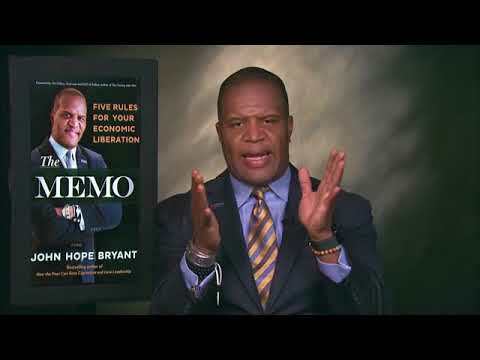 John Hope Bryant, the founder of Operation Hope, stirred up controversy when he warned of the new slavery in América: millions of young people aren’t learning enough and understanding how important it is that they empower themselves. But Bryant’s charges to African-Americas is more than a racial message. He says the problems cross all sorts of lines. Indeed, it is touching when he talks about his “white brothers” who are also having problems. The book is a call for everyone, especially the young, to take charge of their lives. They must realize, he argues, that, without a life plan of self-improvement that young people of all colors, creeds and ethnic backgrounds will be condemned to a life of dependence and disappointment. This interesting book preaches many of the same ideas that we talk about here at GregoryBresiger.com. Although Bryant doesn’t go into all the details on saving and investing on a regular basis—and I wish he had done more with these vital subjects–he rightfully warns that those with low credit scores should be worried; that it indicates they are headed down a one-way path to disaster. And Bryant is a great believer in the traditional way that millions of people moved from poverty to a better life. It is a road travelled by all sorts of different groups over centuries—starting a small business. He also notes that bad credit can also sink your efforts to get a new or better job. That’s because employers will often review credit reports in making decisions on hiring. Here I would add a point that we stress again and again here at GregoryBresiger.com: Learn to be a transactor—pay off credit card bills in full each month and avoid interest—and avoid revolving. Revolvers carry credit balances from month to month along with the outrageous interest charges that come with them. Many of the ideas that Bryant preaches are essential not only for the individual, but our nation or any nation that wants to see improvement from generation to generation. That’s because economic history tells us that countries that have prospered; ones that went from poverty to economic power, did it in large part because millions of individuals started and succeeded with small businesses. Of course, some of those successes only came after many of those same entrepreneurs had started and failed at other ventures. But later they succeeded precisely because they had previously failed (Examples. The Houston Astros are the champions of baseball. Five years ago, they were close to the worst team in baseball. In failing, they learned vital lessons. Sam Walton, the founder of Wal-Mart, had many failing businesses before he latched on to the right retailing formula. It was a retailing formula that has made Wal-Mart the most successful retailer in history). Indeed, Bryant, in one of the most astute parts of the book, writes, “Success is going from failure to failure without loss of enthusiasm.” I love that he quotes Sally Mackin of the Woodlawn Foundation saying, “I take no for vitamins”). It is essential, for many reasons, that Byrant’s message of entrepreneurialism as a message of hope resonates with Americans, and, for that matter, with everyone. Byrant’s message of self-improvement rings true because it is spiritual as well as economic. He sagely says true poverty has little to do with money. “There is a difference between being broke and being poor,” he writes. Bryant ends this short but excellent book with the memo, which includes these bits of wisdom. *We must never give up our childlike curiosity, our hope and our joy. This is a book of hope and self-improvement. What makes the author’s arguments so effective are that they are timeless as commonsense. Their simplicity can disguise their sagacity.